Delgatie Castle has been held by the Hays family since the 14th Century though it is thought that the building dates back to the year 1030. 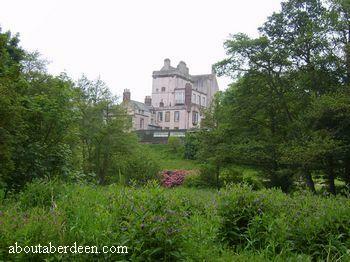 The castle was formerly owned by the Earl of Buchan but was taken from him after the Battle of Bannockburn in 1314. It remained in the ownership of the Hay family since. In 1452 the Hays were made Earls of Errol. 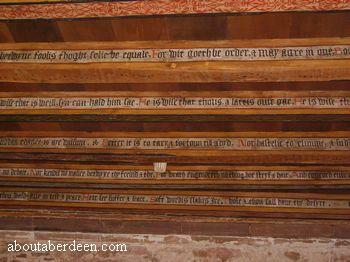 More building work was performed by the Hay family and this was completed by 1579. This included the battlement walk. Delgatie Castle was extended and as you view Delgatie Castle from the main entrance this extension can be seen on the left. This included a chapel and doocot on the West to provide a source of meat during the harsh winter months. A kitchen and the servants quarters were added to the East. Mary Queen of Scots stayed at Delgatie Castle for several days in 1562. 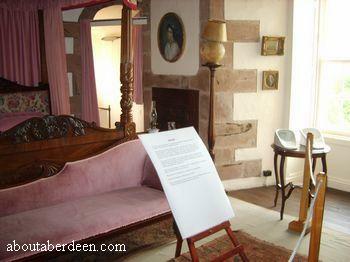 This was after the Battle of Corrichie and the bed chamber room Mary Queen of Scots slept in can be seen by visitors. 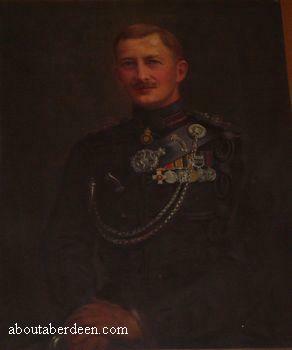 Sir William Hay of Delgatie Castle was the standard bearer to the Marquis of Montrose. He was defeated at Philiphaugh but Hay still managed to return the standard to Buchanan Castle. He was later executed at Edinburgh in 1650. 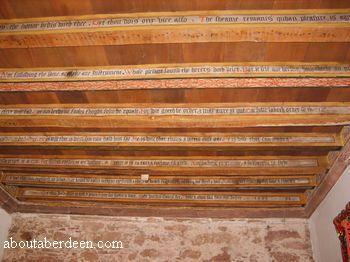 He was buried in Montrose in St Giles Cathedral. Though Delgatie Castle has been held by the Hay family it was briefly owned by the Ainslie family in the late nineteenth century (cited in Castles of the Clans: The Strongholds and Seats of 750 Scottish Families and Clans by Martin Coventry). 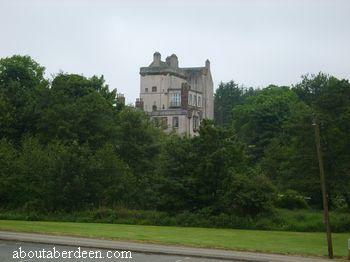 In recent years Delgatie Castle was owned by the Feudal Baron Captain Hay of Delgatie. Prior to his death he turned the castle and the estate into a non profit making charitable trust to take effect upon his death. Delgatie Castle is now the Clan Hay Centre and run as a charity by the Castle Delgatie Trust. This enable the castle and estate to be maintained and restored whilst providing visitors an historical glimpse into one of Scotland's best preserved castles. The motto of the Hay clan is Serva jugum which translates to Keep the yoke. The Castle is haunted by a young lady called Rohaise. She appears in the same bedroom, but only appears when men stay in the room! It is thought she may have defended the Castle when alive. During the Second World War she was seen by many of the soldiers stationed there. They reported her as having red hair. 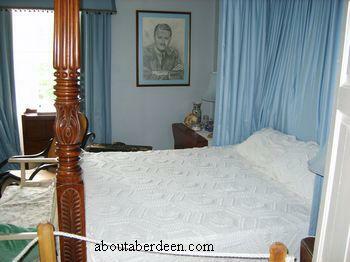 As you can see in the photograph above there is a model of the ghost in the bedroom in which she appears. 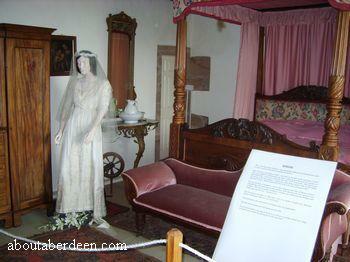 For some time Delgatie Castle had a ghost monk. He was buried in a wall of one of the rooms at the castle and his remains were found after Rachel, a daughter of one of the owners, had a dream about a body being buried in the castle. 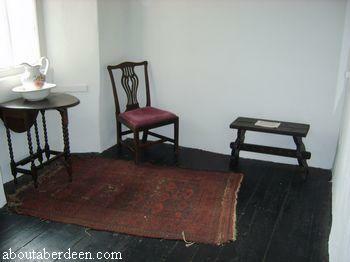 The wall was taken down in the room pictured below and a crouched skeleton with some black cloth was found. The wall was then rebuilt. Delgatie Castle has an unusual example of turnpike stairs that run centrally through the castle because they are much wider than other Scottish castles. They measure over 5 feet in width and make passing people on the stairs much easier. They are also built into the thickness of the castle walls and there are said to be 97 treads on the turnpike stairs. It is thought that Delgatie Castle have the widest example of turnpike stairs in Scotland. These steps are quite steep and sadly there is no disabled access to the upper rooms of the castle. Other notable rooms at Delgatie Castle include The Royal Suite which was named after Prince de Bourbon et Les Deux Ceciles of the Royal French Family after they visited in the 18th Century. 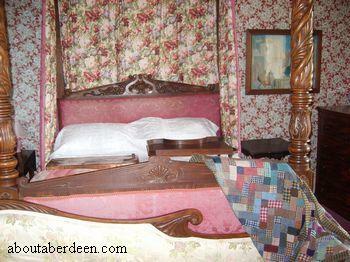 There is a 4 poster bed that dates back to about 1800. 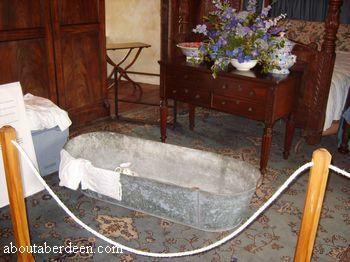 Visitors may note that it is quite small but should bear in mind that in those years people would sleep sitting up in bed so they were made much smaller to modern day beds. The reception hall and dining rooms have fine examples of antique furniture and family portraits and paintings. 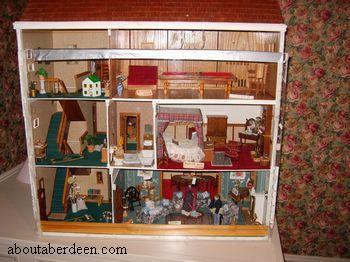 The dolls house room has a collection of family toys and dolls houses. 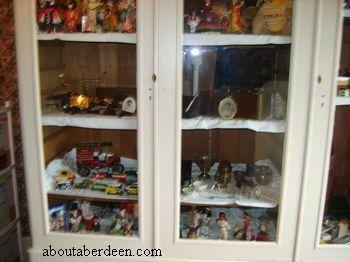 The next room has displays of family collectables such as dresses, top hats, ornaments, games and toys. The chapel leads to a Great Hall and this is now used for wedding receptions. The Ballroom on the upper floor is the largest room at Delgatie Castle and is also used for wedding receptions. A visit to Delgatie Castle is not complete until you have enjoyed a cup of tea and a slice of cake from their Laird's Kitchen. Also on the menu are some delicious homemade soups such as lentil soup and potato and leek soup. 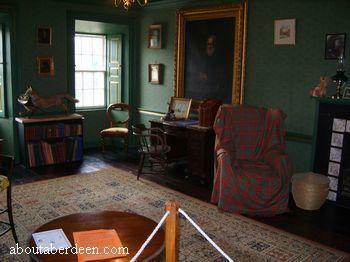 The Laird's Kitchen at Delgatie Castle also sell some delicious cream teas, chocolate cake and scones. Do try and go at a busy time because if the tables are all taken you get to eat in the servants quarters! This large table seats about a dozen people and gives you a rare behind the scenes look into the original kitchen and pantry. Many people visit Delgatie Castle just to enjoy the home made cakes, pancakes and scones at the Laird's Kitchen and there is no admission charge to tour Delgatie Castle for those just visiting the Laird's Kitchen. Toilets are located to the left of the tearoom. 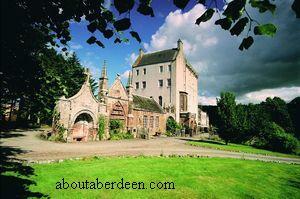 Unlike other Aberdeenshire Castles, Delgatie Castle stays open all year. Delgatie Castle runs various events and these will be described below. In addition the Lairds Kitchen tea room is worth a visit where some delicious meals and snacks can be enjoyed. It is famed locally for its afternoon teas. Visitors to Delgatie Castle can view some fine displays of paintings, armoury and Victorian clothes as they tour the Castle. Look out for the rhino foot at the entrance hall! Each winter Delgatie Castle hosts a traditional Victorian Christmas Fayre where the Castle staff dress in period costume and there is Christmas displays of period toys. Santa Clause will be in attendance and will give a gift to each child who visits him. Local Crafters have stalls where they sell Christmas gifts and Xmas stocking presents.  The cost is �4 a ticket which includes seeing Father Christmas. The 2006 Delgatie Castle Victorian Christmas Fayre took place on Saturday 25 and Sunday 26 November 2006 and again on Saturday 2 and Sunday 3 December 2006 from 10am until 4pm. There was over 30 craft tables selling a range of treats like jewellery, candles, handmade gifts, pottery, local photographs and handmade soaps. The 2007 dates will be announced soon. 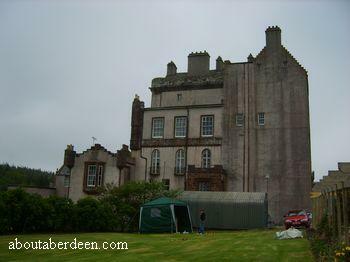 Delgatie Castle hosts a Victorian Summer Fair and in 2007 this was from Saturday 9 to Sunday 10 June from 11am to 4pm. 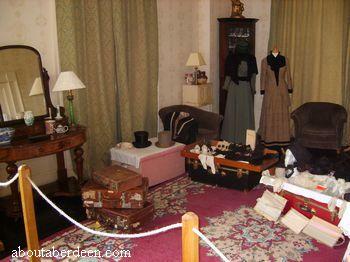 There was traditional Victorian entertainment and activities for adults and children. This included pony and horse rides, clowns, magicians, juggling, coconut shy and other Victorian games, puppet show, face painting, balloon modelling, Victorian barrel organ music and outdoor games. 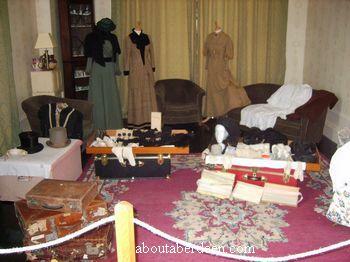 The staff of DelgtieCastle were dressed in traditional Victorian costumes. In addition there were craft and art stalls which included candles, plants, home bakes, Scottish food, garden ornaments, chocolates, clootie dumpling pudding stall, wooden games, ornaments and jewellery. All the crafters also wore Victorian costume. DelgatieCastle was the winner of the 2003 Northern Lights Best Visitor Experience Award. The admission price for our visit to Delgatie Castle was �5 each with no discount price for a child ticket or elderly or disabled concessions. Unusually for a Scottish castle open to the public there was no colour guide book, though there was a free pamphlet and each room has an information sheet. There are no guided tours at Delgatie Castle. The self walk tour of Delgatie Castle is comprehensively sign posted and easy to follow. No photographs or cameras are permitted but there is a small gift shop that sells some beautiful colour picture postcards of Delgatie Castle. 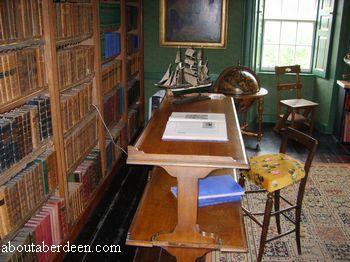 The trustees of Delgatie Castle can organise after hour visits and guided tours by appointment. This can include a supper menu at the Laird's Kitchen. Delgatie Castle is open all year round with events throughout the year such as Halloween parties and fairs. It closes at Christmas and the New Year. The opening times of Delgatie Castle are from 10 am until 5pm. There is a free car parking and a short walk to the castle up a chip bark paved path. Disabled visitors can park at the front of the castle. No dogs are permitted at Delgatie Castle though the car park has a grassed area where dogs can be exercised and behind the car park are Delgaty Woods which is owned by the forestry commission. Directions to Delgatie Castle from Aberdeen - Take the A947 to Dyce and continue through to Oldmeldrum and past Fyvie Castle which is owned by the National Trust for Scotland (NTS). 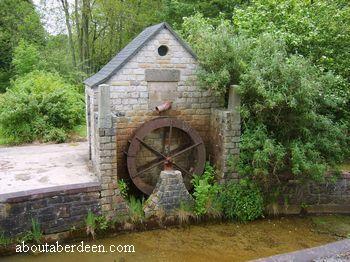 Rather than head through to Turriff take the B9170 at Darra and the Mill of Colp and head to Cuminestown. Delgatie Castle is then signposted. The road to DelgatieCastle is a bit of a track and has some pot holes so please do drive slowly and beware of running deer from the forest. To raise funds for the upkeep of Delgatie Castle there are wedding packages available to the general public and brides and grooms can have a memorable wedding day at Delgatie Castle. Costs can include a wedding service at the Delgatie Castle chapel which sits 20 people and with more standing room at the rear room or in the Yester Ballroom which can comfortably seat 40 people. This intimate weddings at Delgatie Castle have been most popular over the years and have provided many a memorable and romantic start to a marriage. Prices start from �500 and catering can be provided with a wedding breakfast starting at �35 per head for a buffet or �40 for a sit down meal. An evening buffet can be provided from �5 per person and with canapes from �7 per person. Examples of wedding menus include starters such as scotch broth, haggis with onion sauce and smoked salmon with dill sauce. Main courses include fine Scottish fare such as roast beef, haggis stuffed chicken breast in wild mushroom sauce or Scottish lamb or salmon. Sweets and puddings include sticky toffee pudding, sherry trifle, lemon mousse or fresh fruit salad. There are several accommodation packages at Delgatie Castle which are available to the bride and groom and their guests or just for holidays. This includes Castle apartments and the Coach House. 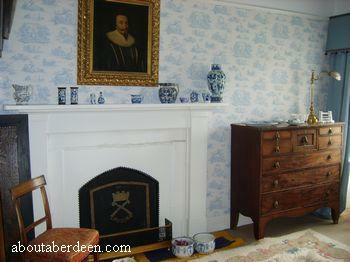 The accommodation at Delgatie Castle is self catering.